Express your advocacy for and commitment to your clients on your resume. Review this sample to learn how. Social workers are necessary for the health and well being of people and communities across the country. To position yourself for the best social worker jobs, express your advocacy for and commitment to your clients on your resume. 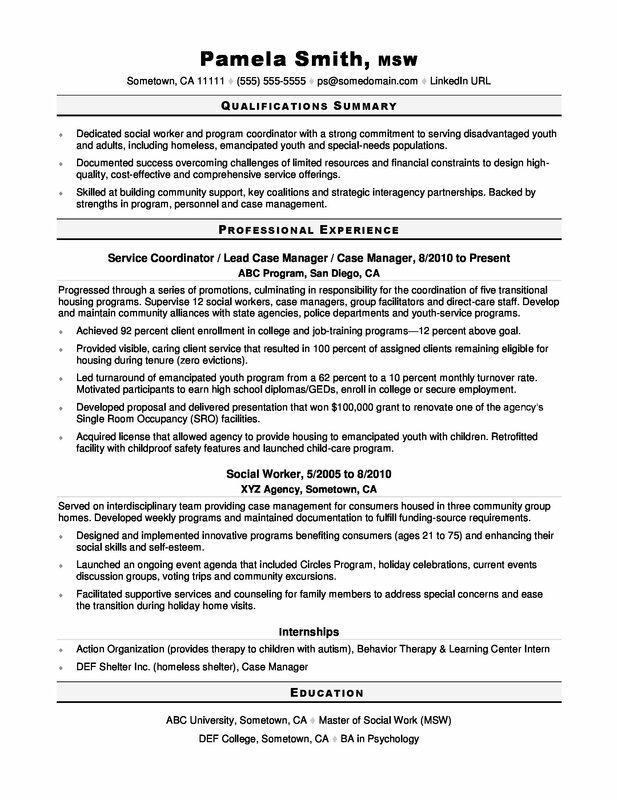 View the sample resume for a social worker below, and download the social worker resume template in Word. Jobs for social workers are projected to grow by 16% (or 109,700 jobs) from 2016 through 2026, which is much faster than average, according to the Bureau of Labor Statistics (BLS). You'll find the highest level of employment for child, family, and school social workers in the following states: California, New York, Pennsylvania, Texas, and Michigan; and in the following metropolitan areas: New York City, Los Angeles, Chicago, Washington D.C., and Boston. As a social worker, you can expect to earn a median wage of $47,980 per year, or $23.07 per hour, according to the BLS. Additionally, you can learn about human services careers on Monster. Dedicated social worker and program coordinator with a strong commitment to serving disadvantaged youth and adults, including homeless, emancipated youth and special-needs populations. Documented success overcoming challenges of limited resources and financial constraints to design high-quality, cost-effective and comprehensive service offerings. Skilled at building community support, key coalitions and strategic interagency partnerships. Backed by strengths in program, personnel and case management. Progressed through a series of promotions, culminating in responsibility for the coordination of five transitional housing programs. Supervise 12 social workers, case managers, group facilitators and direct-care staff. Develop and maintain community alliances with state agencies, police departments and youth-service programs. Achieved 92 percent client enrollment in college and job-training programs—12 percent above goal. Provided visible, caring client service that resulted in 100 percent of assigned clients remaining eligible for housing during tenure (zero evictions). Led turnaround of emancipated youth program from a 62 percent to a 10 percent monthly turnover rate. Motivated participants to earn high school diplomas/GEDs, enroll in college or secure employment. Developed proposal and delivered presentation that won $100,000 grant to renovate one of the agency’s Single Room Occupancy (SRO) facilities. Acquired license that allowed agency to provide housing to emancipated youth with children. Retrofitted facility with childproof safety features and launched child-care program. Served on interdisciplinary team providing case management for consumers housed in three community group homes. Developed weekly programs and maintained documentation to fulfill funding-source requirements. Designed and implemented innovative programs benefiting consumers (ages 21 to 75) and enhancing their social skills and self-esteem. Launched an ongoing event agenda that included Circles Program, holiday celebrations, current events discussion groups, voting trips and community excursions. Facilitated supportive services and counseling for family members to address special concerns and ease the transition during holiday home visits. Just as social workers get plenty of caseloads, hiring managers get plenty of resumes. But unlike social workers, hiring managers will only pay attention to the select few resumes that stand out. Want yours to have a chance at making the cut? Get a free resume evaluation today from the experts at Monster's Resume Writing Service. You'll get detailed feedback in two business days, including a review of your resume's appearance and content, and a prediction of a recruiter's first impression. Let the experts at Monster take some of the stress off the job search by helping you put your polished, most professional foot forward.